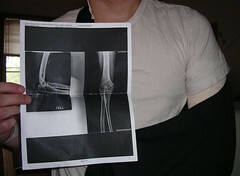 I'll be taking the summer off from releasing new stuff because of a broken elbow. I'll try and finish my submissions for the Toy Karma II show in September though. I hope to still make it down to Chicago for the opening. I wish everyone an awesome summer and hopefully things will turn around soon. like it hurt like crazy. all the things you have going on. Yeah, I'm also totally praying for you...Super hard.